Today I looked at the Sea-Changers Facebook Page and noticed we have 998 page likes. And it got me thinking about what a long way Sea-Changers has come. In 2011, Sea-Changers began with a simple vision. To harness the power and potential of all those who love the sea or run sea related businesses to raise money for marine conservation in the UK. Four years later and we have now given out over 20 marine conservation grants to UK projects ranging from Newquay Marine Group​, National Lobster Hatchery, Surfers Against Sewage, Marine Conservation Society, and Craignish Community Group. This week we will announce who will receive our next round of funding grants. Spread the word - Share this post on your Facebook page and ask your friends to like our Facebook page or follow us on Twitter. We are nudging 1000Facebook likes so it would be great to see numbers sour this week. 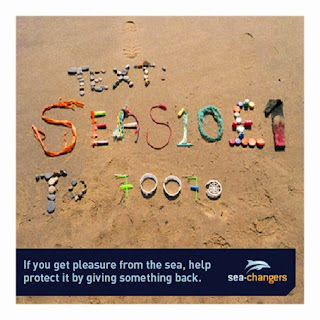 Text for Change – If everyone of our Facebook family texted SEAS10£1 to 70070 today we could give that money directly to a vital marine project in the UK...a thousand pounds! Though we funded some great projects this Spring, there are always some projects we can’t fund due to lack of available funds. You can change that for us right now for less than the price of a cup of tea. Get involved - We are a volunteer run organisation and we are recruiting volunteers right now. If you would like to know more or get involved we would love to hear from you. Please email info@sea-changers.org.uk for more information.